The trade fair highlight will be MENTOR’s new side-light fibre system M-Fibre. The system offers exciting possibilities for both functional and decorative “line lighting” in many different markets. M-Fibre uses single or multi-coloured LED modules for one or two-sided lighting, providing lighting solutions optimised to the application. The impressive physical flexibility of M-Fibre allows complex contours to be created over several metres. In addition to the system’s great physical flexibility and outstanding homogenous light quality, other advantages include low initial costs and short development times. Everyone who is anyone will of course visit MENTOR’s stand! If you turn up speculatively you will receive a warm welcome. If you have a specific project to discuss, and it’s difficult for you to keep to exact times, please contact Multitron to arrange to come onto the stand any time within a specific one hour window. All of MENTOR’s product ranges will be on display, including Light Guides, Handles, Knobs, Keypad Components, Opto Components etc. 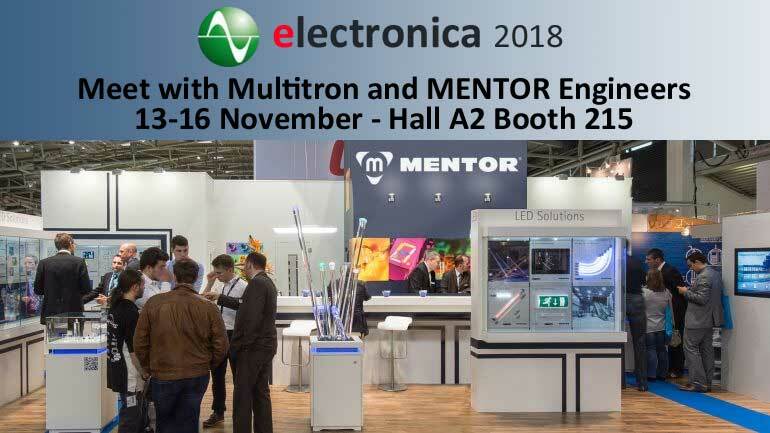 See you at Electronica 2018!